There is a particular smell to a pier. Creosote and lumber and salt water mix together to render an unmistakeable scent. Spending time near the ocean means that at least sometimes you will be on a wooden structure that attempts to extend our domain over the sea. These artifacts are usually short lived, as the sea is rather unforgiving, not to mention that the combination of tar and wood and human activity usually results in a catastrophic fire at some point. I have always preferred this perspective. From underneath the full elegant complexity of these structures is revealed. 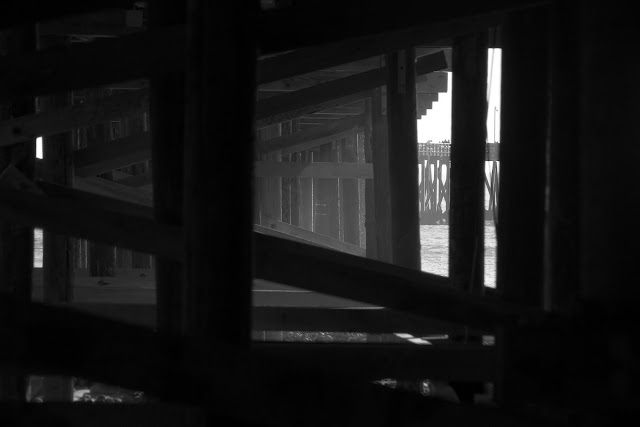 Pilings driven deep into the ocean floor, braces vainly spanning them to provide the strength of a triangle. Huge cross members form trestles on which the actual useful horizontal surface is laid. From above through the cracks one can get a sense of this fragility, and I've never felt completely secure walking on them. From underneath, my feet on solid ground, I can inspect their frailty in comfort. I took this in January of 2010 with my Pentax *istDS and the Tamron 70-300 zoom. The EXIF tells me I shot it at f4 and 110mm. That is probably as wide as that lens could shoot, since I was in my 'shoot everything wide open' phase at that time. I've been experimenting more recently with smaller apertures and more depth of field, but I think it worked out ok in this shot. The ever so slightly out of focus-ness of the near trestle works here because it is completely in shadow. There is no detail lost by the blur. I also really like the central lazy trapezoid shape and the gentle gradient of light from lower right to upper left. Unfortunately I am afraid that the sky detail got blown out, but this is an awful lot of contrast for a little tiny APSC sensor to deal with. There was also a fair amount of purple fringing at the high contrast areas that I eliminated by converting to greyscale. I like black and white but I normally do that with film. Most of the time the greyscale conversion of digital seems slightly dishonest, but I did it here. Too bad you can't smell it.